Runtime: 2 hr. 22 min. 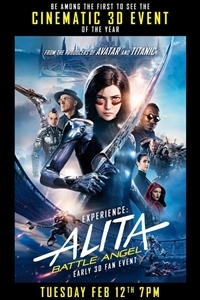 Synopsis: Visionary filmmakers James Cameron and Robert Rodriguez invite you to be among the first to experience the cinematic 3D event of the year, Alita: Battle Angel. Advance screenings will take place in select 3D premium large format theatres. In addition to the film, fans will receive unprecedented access to see a conversation with the filmmakers and cast including James Cameron, Jon Landau, director Robert Rodriguez and cast members Rosa Salazar, Christoph Waltz, Jennifer Connelly, and Keean Johnson and a special inside look at the making of the film.